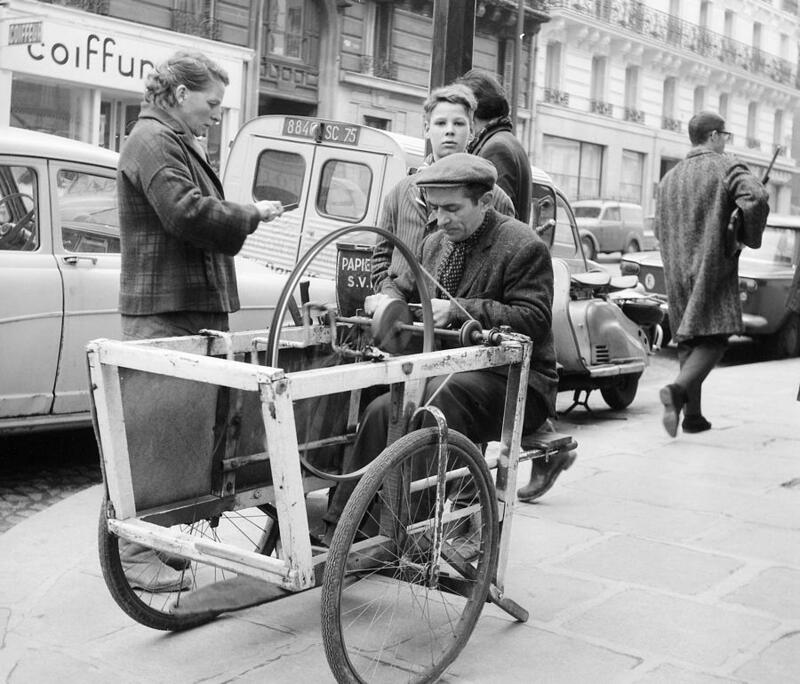 For more than 30 years, Samuel Abt covered bike races for the New York Times and International Herald Tribune. 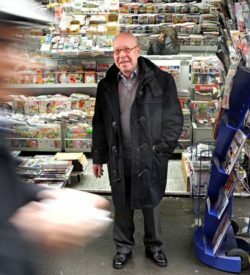 The American writer reflects on some of the changes he has seen. That fellow coming down my street, ringing a bell and wearing on his back a wooden frame holding sheets of glass, repaired broken windows. Nobody breaks them now, I guess, and he’s vanished from the town outside Paris where I live. Also lingering only in memory is the stall in my neighborhood’s Sunday market that dealt exclusively in animal offal. This included tripe, lights, sweetbreads, lungs and sheep testicles, an acquired taste, I was told, that I never tried to acquire out of compassion for the sheep. Some oldtimers, but not me, insist that all things were better in the past. What they were, I think, was not better but different. Where are you now, Dame Pipi? That was the informal name given to all the women who guarded the public toilets in the Paris subway system and let a traveler in for a fixed fee. Those toilets are closed now, replaced by kiosks in the street. Where, for that matter, are the people who sat alongside the turnstiles and punched your ticket? Gone, all gone. Life moves on. Some oldtimers, but not me, insist that all things were better in the past. What they were, I think, was not better but different. That’s not necessarily progress, just change. Change happens in the bicycle racing world too. One day a venerable institution is here, then it’s not. Take the broom wagon. For how many decades did it roll behind a race to sweep up riders who had dropped out, removed their racing number and needed a lift to the team car at the finish? 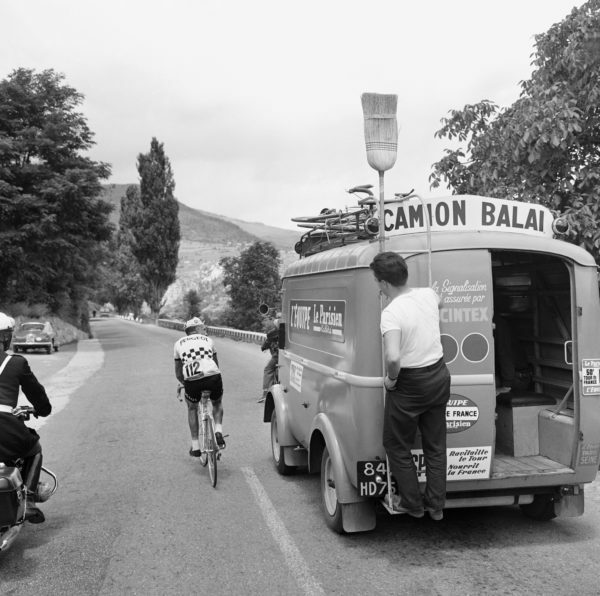 The broom wagon, voiture balai in French, towed a trailer for bikes and sported a broom above its front windows, hence its name. A couple of decades ago, the Tour de France went through a cosmetic updating and that broom was declared too tacky. Down it came. Then some rules were changed too: riders could quit by entering a team car along the route and their bikes could be stowed in the car’s rooftop rack. Passengers are increasingly rare these days although the broom wagon continues to follow some major races. Few riders, no broom—who needs the voiture balai? Into the past it’s rumbling. Joining it there is the bon de sortie, French for the exit pass young students need to leave class and go to the toilet. 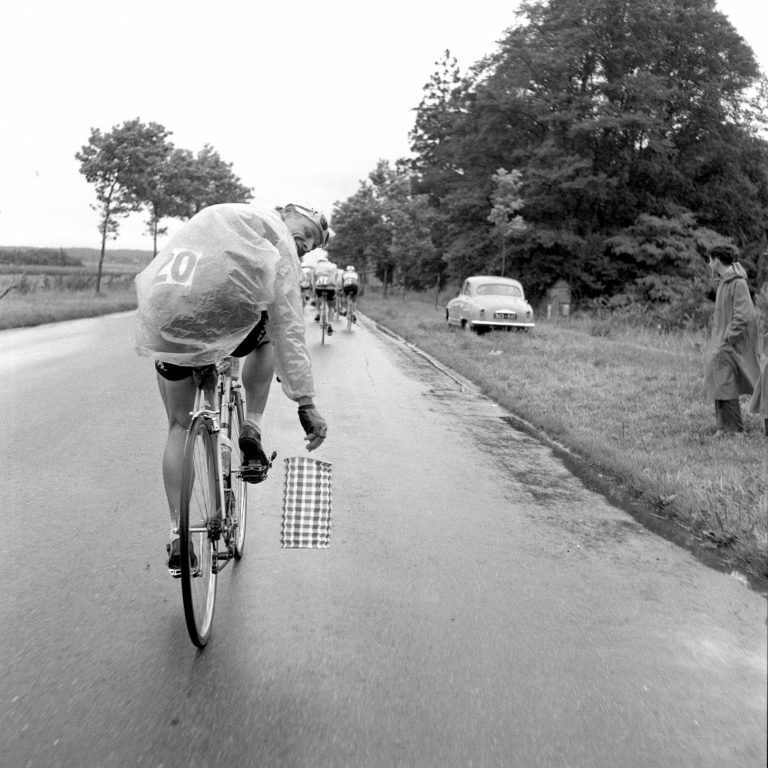 The peloton used to issue (metaphorically) a bon de sortie to a rider when a race passed through or near his home village. Off the rider would zip a few minutes ahead of the pack to embrace his children and kiss maman, then wait to rejoin the pack. The practice was carefully limited. 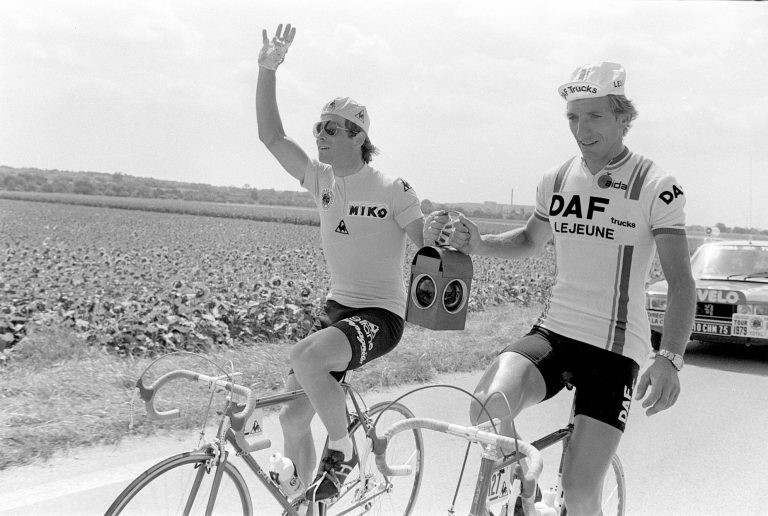 While Marc Madiot, for example, was allowed to go ahead into his village of Renazé, his brother and teammate Yvon was not let off the leash at the same time. Who knew what the two of them might be tempted to do together? That sort of escapade occurred occasionally. No names, please, for the few riders who abused their freedom by whizzing past their families and building a big lead on the pack. For whatever reason, the era of the bon de sortie is over. So too is the wonderfully engaging Tour de France battle to become or avoid becoming the lanterne rouge, the red light that hung at the back of the caboose to signify the end of a train. Newspapers used to cover this contest fully, too fully for the taste of Tour officials. They felt that it was demeaning to celebrate failure and that riders would compete for the title of slowest man in the race, because a celebrity like the lanterne rouge was invited to the many well-paying criteriums that followed the Tour. 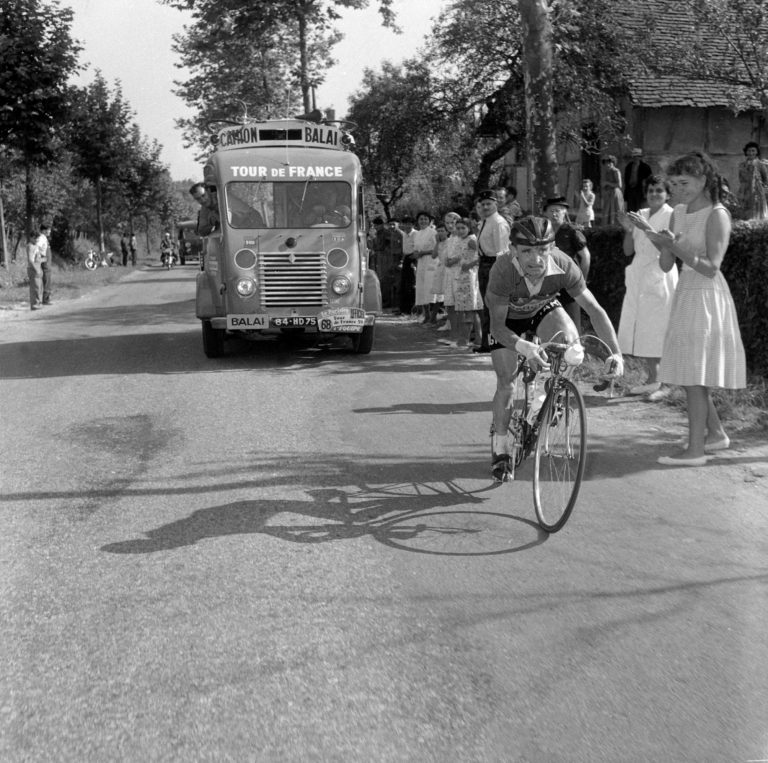 That kind of adulation held no interest at all to one of Vansevenant’s main challengers, Jimmy Casper, a French rider who was twice lanterne rouge in six previous Tours. A strong sprinter, Casper never met a hill, let alone a mountain, he could master. Lanterne rouge is not a position you go for; it comes for you. Casper went all out in the time trial, finishing 83d in the 141-man field, and completed his Tour ahead of only the Belgian. He looked relieved not to have fallen into the cellar. Vansevenant was overjoyed to be there. “This was almost like the fight for the yellow jersey,” he felt. For the record, not that one was allowed to be kept, the last finisher in the 2018 Tour was Lawson Craddock, an American with Education First. 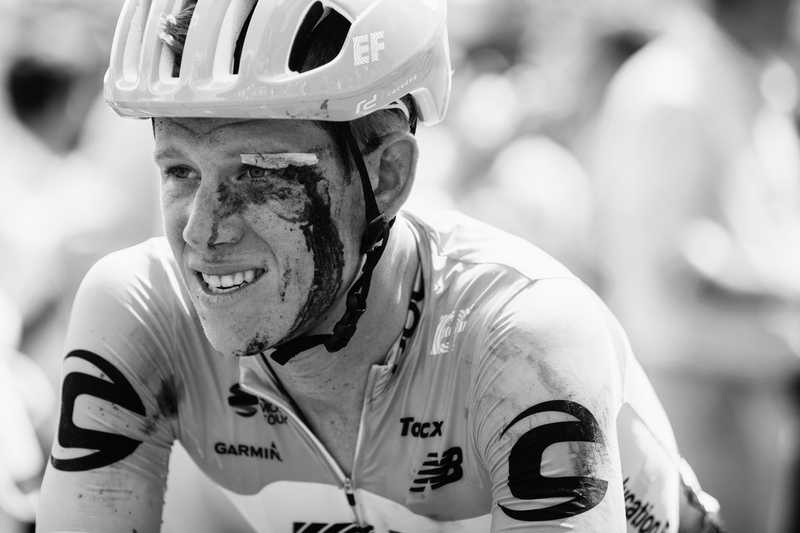 His title comes with an asterisk, since he rode three weeks with a broken left shoulder, courageously alone at the back of the pack but plugging on and into Paris. If he hadn’t made it, the last man would have been Jacopo Guarnieri, an Italian with Groupama. He finished 22 minutes ahead of Craddock, so the non-battle for lanterne rouge was no contest.